Last year at the end of November, I was privileged to train ten emerging Malawian writers in short story writing skills in Lilongwe, Malawi. With me was Billy Kahora who has twice been shortlisted for the Caine Prize –he is also the Managing Editor of Kwani?, Trine Andersen, a Danish writer whose novel, The Red Earth in Mzuzu, is set in Malawi, and Jackee Batanda, an award winning Ugandan writer. Together we talked with the participants about aspects of our writing. The workshop was organized by The Story Club Malawi in partnership with Panafrica Publishers. The Story Club was founded in 2013 by Shadreck Chikoti, together with Alex Lily Banda and Diana Satha, “ as an informal gathering of artists, book lovers, teachers, journalist and those who are passionate about writing. The idea is to meet, celebrate and discuss stories. Stories in all forms, as in; stories in musical lyrics, music, books, films, paintings, photography etc, ” Shadreck said. At the end of the workshop, the writers promised to use the skills they had learnt and promised to integrate their culture into their writing. “I will write more consciously,” Tuntufwe Simwimba said. 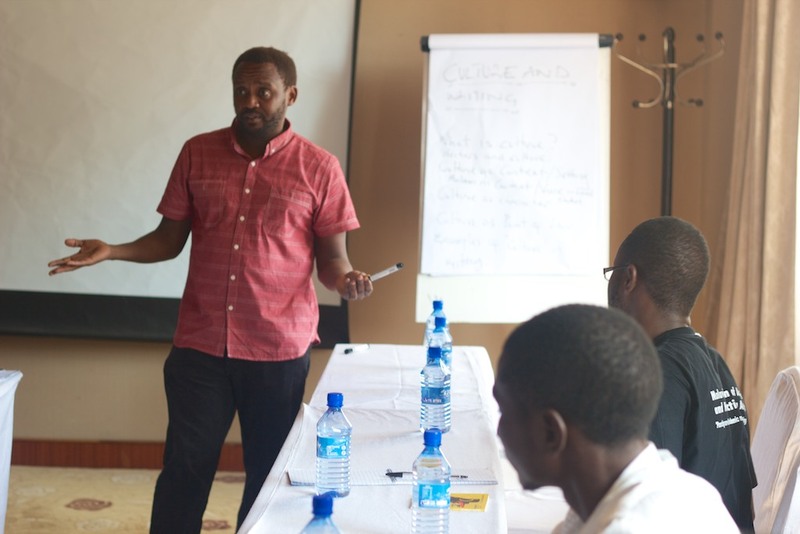 For Malawi and The Story Club, this was the first ever creative writing workshop hosted independently of the traditional literature institutions. I also wanted to use the opportunity to learn more about Malawian literature. Of course, I have read Shadreck Chikoti and Lawrence Kadzitche who I had the pleasure of meeting during the Caine Prize workshop in 2011 in Cameroon. Their stories Child of the Hyena and Twinkle Twinkle Little Star respectively, were published in the 2011 Caine Prize anthology; To See the Mountain and Other Stories. I hope to read more from them soon. Although I’m more familiar with David Rubadiri and Jack Mpanje, the participants introduced me to Smouldering Charcoal by Paul Tiyambe Zeleza. Participants spoke fondly about his writing, and contended that his novel is possibly the most memorable of all Malawian writing. Shadreck promised me a copy of Smouldering Charcoal which I hope he’ll deliver when he comes to Kampala in March. He’ll be attending this year’s international writers’ conference hosted by the African Writers’ Trust. 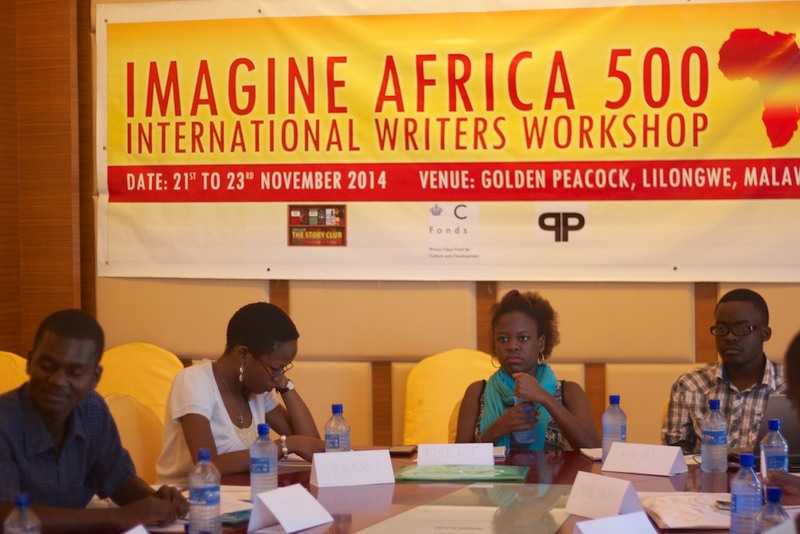 Stories from the participants will be published in an anthology entitled Imagine Africa 500. Ten other writers from the continent shall also be selected to contribute their stories. The anthology will be published by PanAfrica Publishers Ltd. According to Shadreck, the anthology is challenging the notion that “Africans don’t think beyond their problems.” It is to encourage debate on the future of Africa. It is challenging readers and writers to look at possibilities and see if they can contribute and how they can positively do so. “It is meant to be a teaser! A thought provoker and a challenge for both readers and writers,” Shadreck said. We the facilitators were residents at a nice mid range hotel called the Golden Peacock Hotel. I’m not fully certain whether it was a Chinese hotel or just furnished and fitted with everything imported from China. In Uganda I know that the Chinese are building roads and other infrastructure, but I had never thought of them in the vein of Chinese owned investments clearly marked. In the Golden Peacock Hotel, the the televisions and even the toiletries were made in China. Our menu items and all instructions were bilingual; in English and Chinese characters, which was shocking. After the workshop, facilitators volunteered to mentor some of the emerging writers. On the day before we left, we were treated to a day trip to see Lake Malawi. We tasted a local delicacy called chambo. Mine was deep fried, and I preferred it with chips. Chambo is a species of fish similar to tilapia and it is only found in Lake Malawi. There is a common misconception that it is the same as tilapia, but it is not. The adult specimen is only as big as an adult’s hand while Nile tilapia can grow up to a foot long. It’s delicate flesh is white and is served with slices of lemon. Whereas in Uganda we have posho as one of our main staples, the same in Malawi, which is a little softer, is called nsima. It was soothing to visit Lake Malawi –beautiful, clean and surprisingly clear of any signs of the water hyacinth. I did not notice even the more banal plastic bags or mineral water bottles as is the case with Lake Victoria in Uganda. I felt very peaceful. Usually, I am afraid of large water bodies but Lake Malawi didn’t bring out that fear in me. 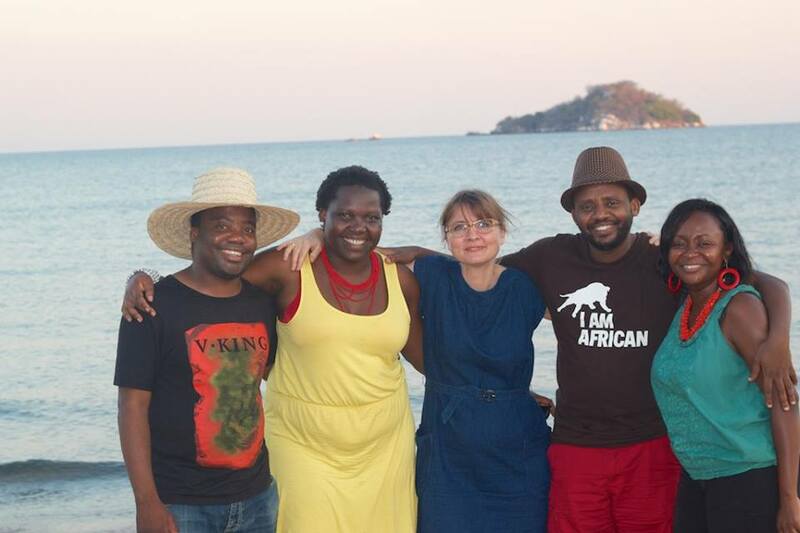 L-R: Shadreck Chiloti, Beatrice Lamwaka, Trine Andersen, Billy Kahora and Jackee Batanda on the shores of Lake Malawi. Photo courtesy of Jackee Batanda. At the moment I am mentoring two of the participants. They are Aubrey Chinguwo and Immulanie Makande. By the end of December, all participants had submitted their short stories for critical guidance by the mentors. Billy Kahora is set to edit the anthology. Shadreck has sent out a social media call for submission to writers across the continent. The call invited, “Writers from all over the African continent and the diaspora to give us their dreams, their dreads, their hopes, and their fictions about a future in Africa in 500 years from now.” Story submissions for consideration in the anthology should be between 3000–3500 words sent in by the deadline date of March 15, 2015. Writers can explore any theme about Africa set 500 years from now. The 10 best pieces will be published in the anthology shortly thereafter. The organisers plan to launch the anthology in Kenya, Uganda, South Africa and of course Malawi. It should be understood that these stories will be submitted for prizes including the Caine Prize. 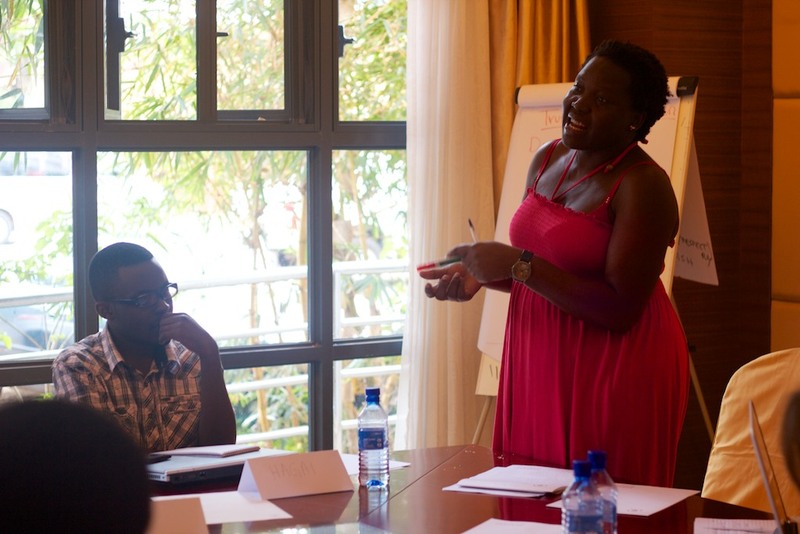 Beatrice is a writer from Uganda and her profile is here. February 5, 2015 in News, Travel Writing.